“Mesa” : A Public Art Work Commissioned by the Seattle Arts Commission for the Woodland Park Zoo, Completed in 1991, Ken Little (Artist). I would start my explanation of the work with quotations from my initial “Letter of Interest” used in application for the project. “My past experience with public art has been exclusively from the public’s point of view. I am a member of this public that has seen, experienced, read, and thought about public art. It is easier, therefore, for me to start by saying what I would not want my own piece of public art to be. I wouldn’t want my piece to encourage our tendency to see animals and the landscape as property, objects, or displays. I’m also not interested in portraying the animals as a wildlife artist or taxidermist might, trying to capture or freeze a lifelike instant -some sort of sentimental remembrance in bronze of a dolphin in mid leap. Given these considerations I wouldn’t want the piece to be self-contained on a pedestal, or separated in a fountain or reflecting pool. I also wouldn’t want it to be jewelry for a building or an exclamation point for the landscape. I’m not interested in doing a kind of animal playground piece that would encourage people to climb on these “objects”, or reinforce the notion like a lot of t-shirts or hats do that the animals are mascots. "Mesa" 1988-91; Bronze; 35"H x 60"W x 60"D; Commissioned by the Seattle Arts Commission, Seattle, Washington. 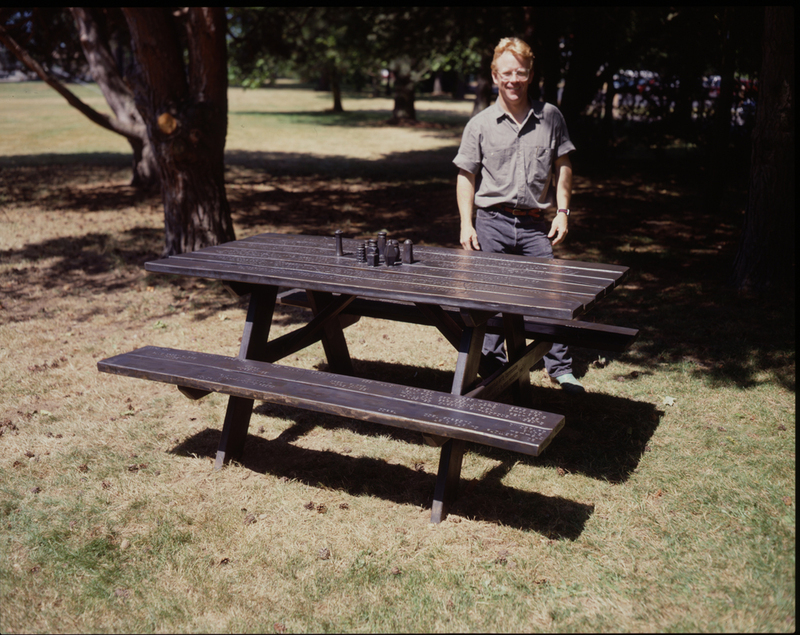 The format I ultimately settled on was that of an old "Forest Service Style" picnic table where people could come, sit , eat, read, talk, and contemplate. The original was fashioned in wood then cast in bronze for curatorial reasons (permanence). 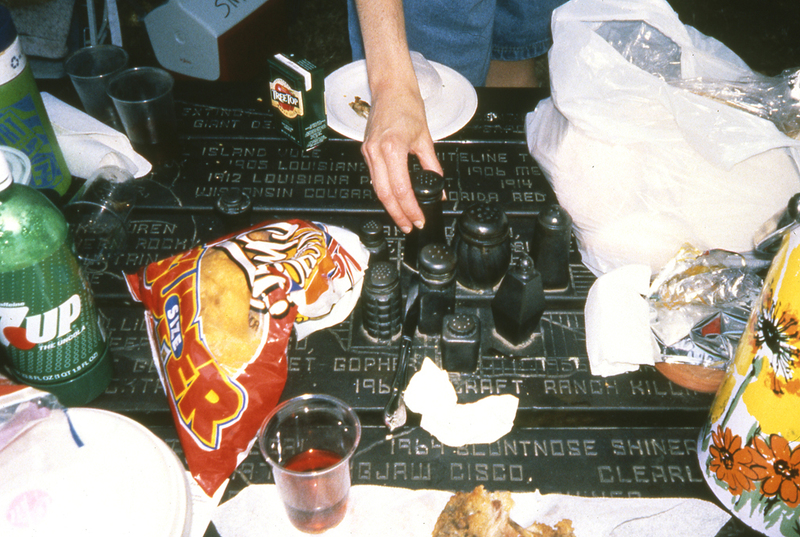 The picnic table, titled "Mesa" is approachable even utilitarian. Carved into the top surface of the table are several overlaid images and text. 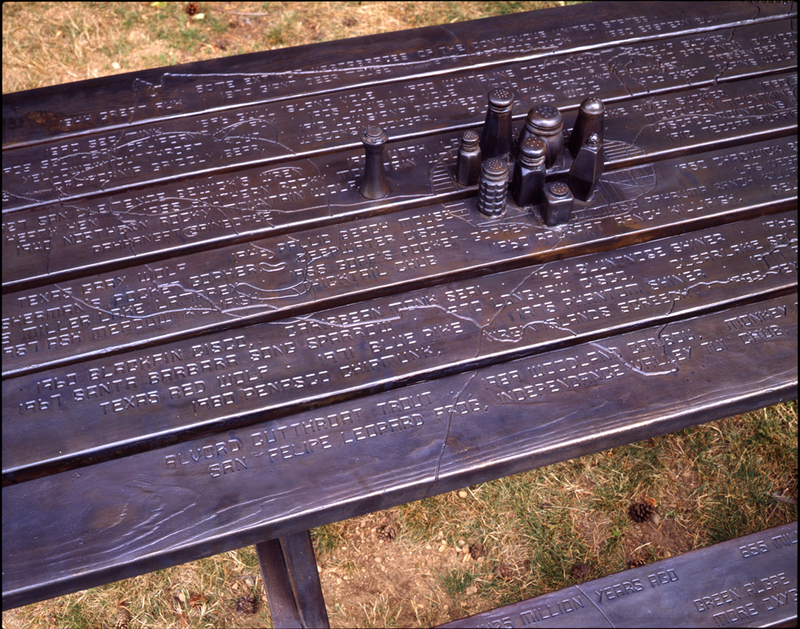 "Mesa" 1988-91; Bronze(table top detail); The outside image is of the political borders delineating the 48 contiguous United States. In the center of the table is a city like street grid system with a "freeway loop" and highways wandering off into the four directions over the edges of the table. There is an imaginary city suggested by the placement of several salt and pepper shakers towards this center. Counterpointing each other are drawings of two masks depicting animals from the northwest: the Grizzly Bear, and the Columbian Peninsula white tailed deer. Entitled and listed in the text are the common names of over 100 species of vertebrates extinct from these 48 states since 1492. They are listed chronologically by year in the order of their disappearance. As I read and engraved the names on the original I conjured up wonderful dreamlike images and memories of animals we'll never know again. To me, they are a symbolic of the wild and vast natural wonder and resource this continent has enjoyed. It is our history, our strength, and our past in relationship to animals and our environment.The salt and pepper shaker city scape represents civilization, plopped down for whatever reason, although usually for some economically exploitive use of animals and for resources in the immediate environment. Along with other things, this isolation of reason, avarice, and greed currently feeds the spiritual and environmental quandary we manifest as a nation. The bear and deer masks are predator and prey, omnivore and grazer, symbolic of the fragile interconnected web of life in these 48 United States. Both species are currently named on the federal governments “Endangered Species” list for the northwest. 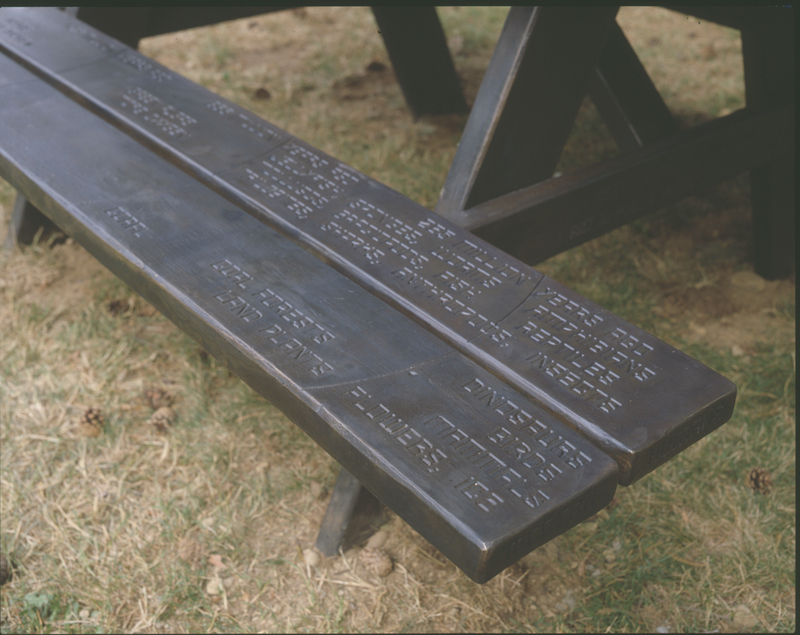 "Mesa" 1988-91; Bronze (seating bench detail); Into the benches or seats of the "Mesa" is carved a geological time chart of the earth's evolution as we understand it at this time. In scale the evolution over 4,500 million years is about 12 feet long. That roughly places about 500 million years in every 16 inches or so. The distances within each crescent are listed in "millions of years ago". Key words are also listed along the way to show major events or activity during these periods like: cloud, water, oxygen, algae, coral, volcanoes, etc. The last 8-10 inches symbolizes the last 250 million or so years. During this most recent period most of the major geological and all of the life forms as we know them have evolved. Some have also disappeared (dinosaurs for one). The rise to dominance of modern humans (or the last 50,000 years) was impossible to represent over this twelve foot scale as it would appear as a sheet of paper glued to the end of the bench. Therefore the words "modern humans" are carved into the end of the bench. I hope the meaning here is obvious. We are small, yet very powerful parts of an immense history continually evolving this very day. "Mesa" 1988-91; Bronze (detail in use) ; After I installed "Mesa" in 1991, I took some rather formal documentary "art" photographs. 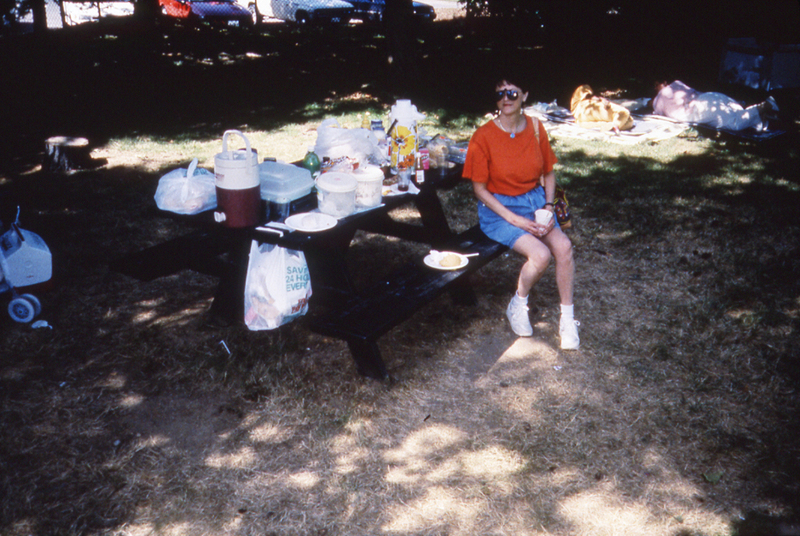 The table was alone under the pine trees That was in July of 1991. Recently a friend visited the site and returned with pictures of this elegant black table with potato chip bags, plastic soft drink cups, tupperware, and fast food packaging almost covering the table itself. With people using it this way it is all the more developed and meaningful as a work of art. I hope the combination of life and art communicates the message of the responsibility we have as the human species to the animals and other resources in our environment. I want people to contemplate the power we carry and consider the responsibility we have to all other beings and elements of this fragile planet Earth. As with any work of art there will be multiple readings and interpretations realized over a period of time. Many times very obvious concepts are invisible to the artist at the time of conception and fabrication. Those readings will come out in time.